Canadian-born Desmond Montague served the Allied cause during World War II as an airman and navigator. He was assigned to the Royal Air Force Squadron Number 142 which specialized in long range bombing missions. Along with the others in his squadron, Desmond was stationed in Foggia, Italy. They all lived in tents on the military base. Desmond had heard many positive statements about the mild climate in southern Italy but during the time that he was in Foggia, he found it ironic that it rained incessantly. One day, Edward Wiseman, the pilot of the aircraft that Desmond was assigned to, asked him if he knew the meaning of the word, “stigmata.” Desmond told Edward that he was familiar with the term. Desmond was a devout Catholic. He kept a Rosary in his pocket at all times and had always been a person of faith. His own brother was a Catholic priest. Edward Wiseman told Desmond that he had heard that there was a priest living at the monastery of Our Lady of Grace in the nearby town of San Giovanni Rotondo who had the stigmata. Desmond was interested in what Edward shared about the priest but he was also very skeptical. He was almost sure that it was not true. The next day, Desmond and his good friend Lyell Bachelder, a fellow air force officer, decided to find out for themselves if Edward’s information about the priest who reportedly had the stigmata was correct. The two men walked from the airfield where they were stationed to the monastery of Our Lady of Grace in San Giovanni Rotondo. Due to the heavy wartime bombing that had taken place in and around Foggia, there were no longer any roads to travel on. They walked over hills and embankments through the dry and desolate terrain. When Desmond and Lyell finally arrived in San Giovanni Rotondo, the first person they met was a friendly American woman named Mary Pyle. Mary confirmed that what Edward Wiseman had told them about the priest was true. Mary told them that the priest’s name was Padre Pio and that he had the five wounds of Christ, the stigmata. “Would you like me to take you over to the church so that you could meet him?” Mary asked. Desmond and Lyell said that they would be very happy to be introduced to him. Mary took the two army officers over to the church and gave them specific instructions. She said that it was important that all visits with Padre Pio be conducted in a dignified and respectful manner. She added that they should let Padre Pio handle the visit his way. Soon Desmond and Lyell heard Padre Pio come into the church. Just like Mary Pyle had told them, Padre Pio knelt down in the pew behind them. They could hear his soft voice and the sound of his beads as he prayed the Rosary quietly. After a time, Padre Pio touched them on the shoulder and they stood up to greet him. Padre Pio seemed happy to meet the two officers. He had magnificent dark eyes and a beautiful smile. Trying to be discreet, the two men could not help but glance at Padre Pio’s hands. Mary Pyle had already confirmed to them that Padre Pio had the stigmata. They noticed that Padre Pio wore brown woolen half gloves which covered the wounds completely. 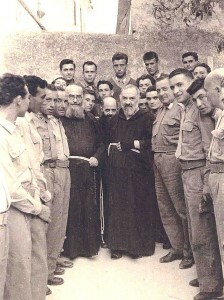 Padre Pio was very friendly to the officers. He gave both of them a small crucifix as a gift. He also gave them his priestly blessing. Before he said goodbye, he patted both of the men on their heads. The simple and loving gesture reminded them of the way a father might affectionately pat the heads of his own sons. Padre Pio made Desmond and Lyell understand that he would watch over both of them. A short time later, the two men made a second trip to Padre Pio’s monastery. They were able to attend Padre Pio’s Mass but were not able to speak with him. They brought jam, sugar and tea for Mary Pyle and for the Capuchins. On their previous visit, they had noticed that those items were in short supply due to wartime food rationing. The next day, Lyell woke up feeling very ill. A visit to the doctor revealed that he had contracted malaria. His condition was so serious that he had to be hospitalized. Desmond and the other members of the crew were departing on a bombing mission to Budapest, Hungary that very evening. Lyell’s position as bombardier had to be filled by another airman. The crew left on the evening of April 16, 1944 with the railway yards of Budapest as their central target. They all considered it to be a routine bombing raid, no different from many others they had already participated in. The aircraft used for the bombing mission was a Wellington Mark II – a twin-engine night bomber. At that time, flights were accomplished by celestial navigation. Noting the position of the stars as well as consulting air almanacs and tables, and using instruments that measured horizon and altitude, the navigator could plot a very accurate course to the designated target area. After successfully completing their bombing mission in Budapest, Desmond and the other crew members set course to return to their military base in Foggia. They kept on a constant lookout for dangerous German night fighter planes. That particular night, the stars were magnificent, shining like jewels against a dark canopy of endless sky. The men always wore their parachute harnesses during flight, with the parachute pack right beside them for immediate access. Hearing the pilot’s order, Desmond quickly tried to clip his pack to the parachute harness so that he could jump out of the plane. However, the simple task proved to be impossible. The sudden change in altitude and the strong gravitational forces that were present prevented Desmond from moving his arms. Completely immobilized, he was pressed against the wall of the plane. As the plane made a nose dive to the ground, Desmond was certain that he was going to die. He said a very quick prayer, “Jesus, Mary, and Joseph, help me!” and then he lost consciousness. When Desmond regained consciousness, he was shocked to find that he was wrapped up in his parachute. How could it be? He had not been able to clip his parachute pack on after the plane had been hit. The plane had gone down in a mountainous region of Yugoslavia. He estimated that it had been approximately two hours since the plane had crashed. Desmond had received only minor injuries. There was a deep cut on his leg and on his face. Also, some of his teeth had been broken off. Other than that, he was in good condition. It seemed like a miracle to him that he had survived. All of the other members of the crew had died in the crash. Desmond quickly buried his parachute. He did not want the Germans to suspect that there were any survivors in the plane crash. He then walked toward an isolated farmhouse which he saw in the distance. As he drew closer, he noticed that there was debris from his fallen plane in the yard of the farmhouse. Desmond knocked on the door. The farmer and his wife who greeted Desmond were very kind. The wife cleaned and dressed the wounds on his leg and face. The man handed him a glass of an unidentifiable liquid which he was very happy to accept. As he drank it, he felt an intense burning sensation in his throat and stomach. It turned out to be straight vodka. Desmond could sense the fear of the farmer and his wife and under the circumstances, their fear was understandable. In German-occupied Yugoslavia, it was very dangerous for anyone to assist a member of the Allied troops. By allowing Desmond to come inside their house and by helping him, the couple was putting their own lives in danger. Desmond was hoping that the farmer would help him to escape by directing him to the Yugoslavian partisans who, at that time, were resisting the German occupation. The farmer put Desmond in his wife’s care and left the house momentarily. He soon returned with several well-armed German soldiers. They arrested Desmond on the spot. He would spend the next thirteen months in Prisoner of War camps in different parts of Germany. As the war drew to a close, the Prisoner of War camp south of Lubeck, Germany where Desmond was held captive was liberated by General Montgomery’s troops. World War II, which caused more casualties than any other war in history, finally ended on May 8, 1945. Desmond was flown back to England on the eve of V-E Day and a short time after that, returned to his home in St. John, New Brunswick. When he saw his mother, she said to him, “Desmond, I am certain that it was the priest in Italy who saved your life!” After his first trip to the monastery of Our Lady of Grace, Desmond had written to his parents and told them all of the details of his visit. He also sent them a photograph of Padre Pio. Desmond had a wonderful reunion with his entire family. He felt strong, both physically and mentally, and was profoundly grateful to be alive. Desmond then traveled to Montreal, Quebec to be reunited with his good friend, Lyell Bachelder. 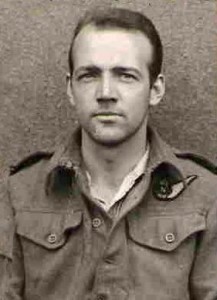 Desmond learned that Lyell had made a complete recovery from the malaria that had prevented him from participating in the doomed bombing mission to Budapest. After Lyell recovered, he was assigned to a Canadian Bomber Squadron. He flew on sixty bombing raids in enemy territory. At that time, the mortality rate for airmen sent on bombing missions was as high as 50 percent. Lyle safely and successfully completed all of his assigned missions. Desmond’s brother, Father Robert Montague, was deeply grateful that Desmond had survived the grave dangers of the war. He hoped that someday he would be able to go to San Giovanni Rotondo so that he could thank Padre Pio personally for saving his brother’s life. In 1963, he was finally able to make the trip. As a married couple, Lucia and Carlo Barocchi were blessed to have enjoyed many happy years together. They seemed to be of like mind and like heart in almost every way but one – that of religion. Lucia was a devout Catholic while Carlo had no religious affiliation whatsoever. Lucia accepted the fact that her husband was not a person of faith and it proved to be no obstacle to their deep love and commitment to each other. Lucia had a great devotion to Padre Pio. 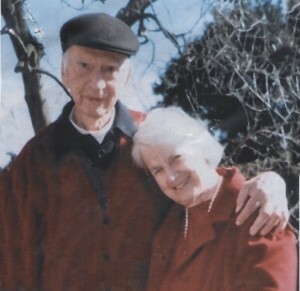 She had met him for the first time in 1950 and in 1951 he accepted her as his spiritual daughter. Every year she made a trip to San Giovanni Rotondo and looked forward to it with great anticipation. She used to repeat, “In San Giovanni Rotondo, even the air one breathes is holy.” Sometimes her father accompanied her, but Carlo would not go with her, feeling no attraction or interest in making the trip. In 1959, Lucia was in San Giovanni Rotondo waiting to make her confession to Padre Pio. The number of people who had signed up for confession turned out to be much larger than usual and Lucia realized that she probably would not be able to get home in time to spend Easter with her family. She wrote to Carlo and to her father, explaining that they would need to travel to San Giovanni Rotondo if they wanted to spend Easter with her. They wrote back to her and said that they would be arriving soon. The next morning Carlo’s father-in-law insisted that they go to the monastery to greet Padre Pio but Carlo was resistant to the idea. He had come to San Giovanni Rotondo in order to spend Easter with his wife, and nothing more. Carlo’s father-in-law did not want to take “no” for an answer and finally persuaded Carlo to accompany him. “I will go with you but I would like to remain at a distance from Padre Pio. I do not want to get too close to him,” Carlo said. Along with many other men, Carlo and his father-in-law waited for Padre Pio in the St. Francis room. Carlo stood as close to the wall as he could, trying in his own way to remain hidden. In the tightly packed crowd, he was very glad to be inconspicuous. Carlo’s father-in-law had been able to position himself in the very front of the group of men. When Padre Pio walked into the room, his father-in-law was so close to Padre Pio that he was able to take his hand and kiss it. Padre Pio then turned and looked directly at Carlo. “Son, you cannot be without God,” he said to Carlo. Carlo couldn’t believe it. He was stunned. Even though they had never met, Padre Pio obviously knew the disposition of his heart. It was a tremendous moment for Carlo. When Carlo walked back into the church where Lucia was waiting for him, his eyes were filled with tears. He felt that he had been, “conquered for life.” Suddenly he knew what he had to do. He presented the ticket his father-in-law had given him and waited in the confessional line to make his confession to Padre Pio. The following year, Padre Pio accepted Carlo as his spiritual son. From that time forward, Carlo was at Lucia’s side every Sunday at Mass. Later, when Carlo became ill and confined to a wheelchair, attending daily Mass was his greatest consolation. As Carlo’s health continued to decline, Lucia cared for him with great devotion, seeing to his every need. They had been married for sixty-four years. At the end of his life, Carlo had the blessing of receiving the Last Rites of the Church and he died a peaceful and holy death. From Seoul, South Korea – Amazing Grace Some time ago, one of my American friends gave me a photo of Padre Pio. I was grateful for his gesture but I didn’t really believe what he said to me about Padre Pio. But I kept the photo in my Bible anyway. Also, another friend sent me a Christmas gift which included a book on Padre Pio. Even though I flipped through the pages, I still found it hard to believe, so I just put this book on the shelf and I forgot about Padre Pio. Last year (2013) in the summer, while I was sitting in the Mapo Library in Seoul, I was reading one of the testimonies on the Padre Pio website (www.padrepiodevotions.org) just out of curiosity. And while I was reading, there was one story which really struck me because the story seemed so much like my sister’s situation. It was the story of a thirty-four year old man who had a nervous breakdown and had stopped going out of the house and was living the life of a recluse. My sister was in a terrible situation because she had been unable to find work for many years and was often ill and depressed. She frequently refused to go out of the house, was not meeting or seeing people, and she cried a lot. We were very worried about her and also exhausted after trying in many different ways to help her, and nothing had worked. So, after I read the testimony, I decided to pray to Padre Pio. There in the library, I prayed sincerely and with my whole my heart to Padre Pio, asking for his help. And then I started to smell a really clear and fresh flower scent of violets! The windows were all closed in the library and the air conditioner was running, so I was really perplexed. It was very, very strange. There was no place that the beautiful, fresh scent of flowers could possibly come from. I realized then that Padre Pio was going to help my sister. And then I prayed and waited. Right after that, my brother applied for enlistment into the Navy. On the day that he went for his medical examination, there were many other young men there who were also having their physicals. When my brother’s name was called, he was told, “Tu Vai,” the very same words that Padre Pio had said to him. Evidently he looked so healthy that he was waved on ahead of the others and was accepted without a physical exam. My brother had a wonderful career in the Navy, working in the field of shortwave communication. He traveled to many different parts of the world and was never sick nor troubled by any problems with his heart. My brother told me that as long as he lives, he will never be able to forget the way Padre Pio looked at him with those beautiful, piercing eyes.